The Gate Clock Bar in the Dublin airport is the place for those leaving Ireland to get their last real pint of Guinness. It was there, at around 6 a.m. some 15 years ago, that Patrick Reilly met Seamus Loftus. They were introduced by Patrick's wife Deni. A couple weeks ago, Loftus and the Reillys were at the bar at the Brass Door talking over, yes, a pint of Guinness. The Reillys, who own the Majestic Grille and run the Front Porch, were brought in as consultants to bring order at the Brass Door, which is owned by Loftus and Meg and Scott Crosby. "It's a selfish project for us," says Deni. The Reillys felt a connection to the Brass Door. They loved the building, saw the potential. Downtown should have an Irish pub, they thought. A place where soccer fans can gather and watch the games. What the Brass Door needed, they believed, was just a little guidance. "The team needed a new captain," says Loftus. "We found a new captain." 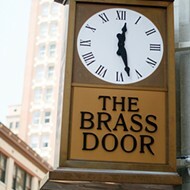 The Brass Door, which had closed in July, reopened in early November. The pub was given a good cleaning, and equipment was updated. A new staff was hired. 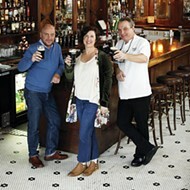 The Reillys sought to bring consistency to the pub's hours, the service, and the food. Some of the Brass Door's tried-and-true favorites remain on the menu. The fried goat cheese is there, as are the hand-cut fries, Shepherd's Pie, and the BELT sandwich. 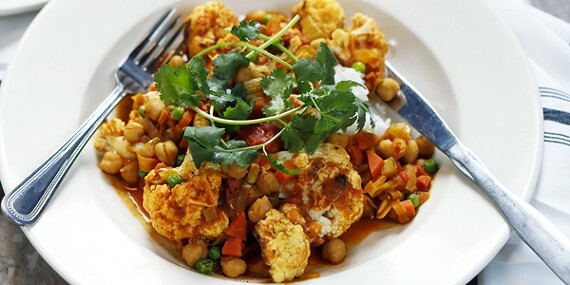 One new dish is the Vegetable and Chickpea Balti. Balti is a Pakistani curry. This is Patrick's nod to Birmingham, England's soccer culture and its large Pakistani population. They've also upped the Irish on their drinks menu. There's Mangers Irish Cider and Murphy Goode wines. They're also aiming to have the most extensive collection of Irish whiskeys in the city, including the Dubliner, Sexton, and Power's John's Lane. Among their speciality cocktails is the Caskmates Stout Pairing with Jameson Caskmates Stout mixed with Guinness and the Black Barrel Old Fashioned made with Jameson Black Barrel. There is, of course, Irish coffee. 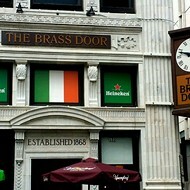 One more thing: The Brass Door is now completely smoke-free, even the smaller side bar. Deni says once word got out that they were reopening the place, she was flooded with texts and emails. "People have real feelings about this Irish pub." "It's the old Door and the new Door," Loftus says. "It's the future and the past." Brass Door is open Monday through Saturday, 11 a.m. to 9 p.m., and Thursday through Saturday, 4 p.m. to 11 p.m. Special early-morning Saturday and Sunday hours for international soccer matches. Daniel Masters has a lot on his plate these days. The owner of Silly Goose recently opened the jazz bar Pontotoc in the old Cafe Pontotoc space and is now making the finishing touches on Civil Pour, a bar inside the food hall South Main Market, which will have its grand opening on December 2nd. 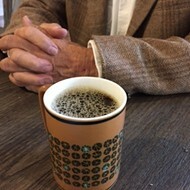 Masters says that when the Cafe Pontotoc space opened up for rent, there was a lot of interest. He, for one, wanted a spot that was still downtown but a bit away from all the foot traffic where Silly Goose is located. He wanted to spread his culinary wings a bit. 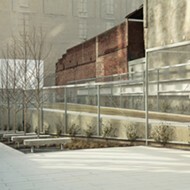 Masters is partnered with Jeremy Thacker-Rhodes and Matthew Thacker-Rhodes. They stuck with the name because they simply liked it. It means "land of hanging grapes" in Chickasaw. 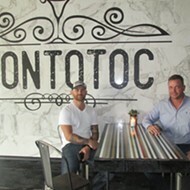 Pontotoc opened in mid-October. Chef Chris Yuer is in charge of the kitchen. The menu can be described as Mississippi Southern: PBR Boiled Peanuts, Alligator Filet Fritters, Sister Schubert Beignet with sour cream gelato ... There's also duck confit, pot roast, and pork belly. 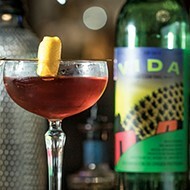 Pontotoc's cocktail menu features the classics — Side Car, Manhattan, and Moscow Mule. And there are seasonal Old Fashioneds and Daiquiris. The winter Old Fashioned includes pecan bitters. For the space, the owners carved a cute, sorta enclosed patio out front and brought in a large chandelier as a focal point for the interior. They took out a divider to make a larger dining space and covered up a window looking into the kitchen with a back mirror. They added a piano, too, all the better for this jazz bar specializing in classic jazz from all eras. They'll have live music Thursday from 6:30 to 9:30 p.m. and Friday through Saturday 7:30 to 10:30 p.m.
As for Civil Pour, Masters says he's still working on the identity of the place. He says he's leaving the Jell-o shots at Silly Goose and is envisioning top-notch charcuterie plates and old school cocktails like a Sazerac made with French cognac. 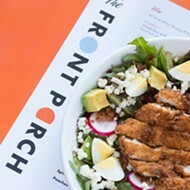 Pontotoc is open Monday through Friday 4-11 p.m., and Saturday 2 p.m.-midnight, and Sunday 11 a.m.-11 p.m.